Let’s face it: in times of war, the Constitution tends to take a beating. With the safety or survival of the nation said to be at risk, the basic law of the land — otherwise considered sacrosanct — becomes nonbinding, subject to being waived at the whim of government authorities who are impatient, scared, panicky, or just plain pissed off. The examples are legion. During the Civil War, Abraham Lincoln arbitrarily suspended the writ of habeas corpus and ignored court orders that took issue with his authority to do so. After U.S. entry into World War I, the administration of Woodrow Wilson mounted a comprehensive effort to crush dissent, shutting down anti-war publications in complete disregard of the First Amendment. Amid the hysteria triggered by Pearl Harbor, Franklin Roosevelt issued an executive order consigning to concentration camps more than 100,000 Japanese-Americans, many of them native-born citizens. Asked in 1944 to review this gross violation of due process, the Supreme Court endorsed the government’s action by a 6-3 vote. More often than not, the passing of the emergency induces second thoughts and even remorse. The further into the past a particular war recedes, the more dubious the wartime arguments for violating the Constitution appear. Americans thereby take comfort in the “lessons learned” that will presumably prohibit any future recurrence of such folly. Even so, the onset of the next war finds the Constitution once more being ill-treated. We don’t repeat past transgressions, of course. Instead, we devise new ones. So it has been during the ongoing post-9/11 period of protracted war. During the presidency of George W. Bush, the United States embraced torture as an instrument of policy in clear violation of the Eighth Amendment prohibiting cruel and unusual punishment. Bush’s successor, Barack Obama, ordered the extrajudicial killingof an American citizen, a death by drone that was visibly in disregard of the Fifth and Fourteenth Amendments. Both administrations — Bush’s with gusto, Obama’s with evident regret — imprisoned individuals for years on end without charge and without anything remotely approximating the “speedy and public trial, by an impartial jury” guaranteed by the Sixth Amendment. Should the present state of hostilities ever end, we can no doubt expect Guantánamo to become yet another source of “lessons learned” for future generations of rueful Americans. Yet one particular check-and-balance constitutional proviso now appears exempt from this recurring phenomenon of disregard followed by professions of dismay, embarrassment, and “never again-ism” once the military emergency passes. I mean, of course, Article I, section 8 of the Constitution, which assigns to Congress the authority “to declare war” and still stands as testimony to the genius of those who drafted it. There can be no question that the responsibility for deciding when and whether the United States should fight resides with the legislative branch, not the executive, and that this was manifestly the intent of the Framers. On parchment at least, the division of labor appears straightforward. The president’s designation as commander-in-chief of the armed forces in no way implies a blanket authorization to employ those forces however he sees fit or anything faintly like it. Quite the contrary: legitimizing presidential command requires explicit congressional sanction. Actual practice has evolved into something altogether different. The portion of Article I, Section 8, cited above has become a dead letter, about as operative as blue laws still on the books in some American cities and towns that purport to regulate Sabbath day activities. Superseding the written text is an unwritten counterpart that goes something like this: with legislators largely consigned to the status of observers, presidents pretty much wage war whenever, wherever, and however they see fit. Whether the result qualifies as usurpation or forfeiture is one of those chicken-and-egg questions that’s interesting but practically speaking beside the point. This is by no means a recent development. It has a history. In the summer of 1950, when President Harry Truman decided that a U.N. Security Council resolution provided sufficient warrant for him to order U.S. forces to fight in Korea, congressional war powers took a hit from which they would never recover. Congress soon thereafter bought into the notion, fashionable during the Cold War, that formal declarations of hostilities had become passé. Waging the “long twilight struggle” ostensibly required deference to the commander-in-chief on all matters related to national security. To sustain the pretense that it still retained some relevance, Congress took to issuing what were essentially permission slips, granting presidents maximum freedom of action to do whatever they might decide needed to be done in response to the latest perceived crisis. The Tonkin Gulf Resolution of 1964 offers a notable example. 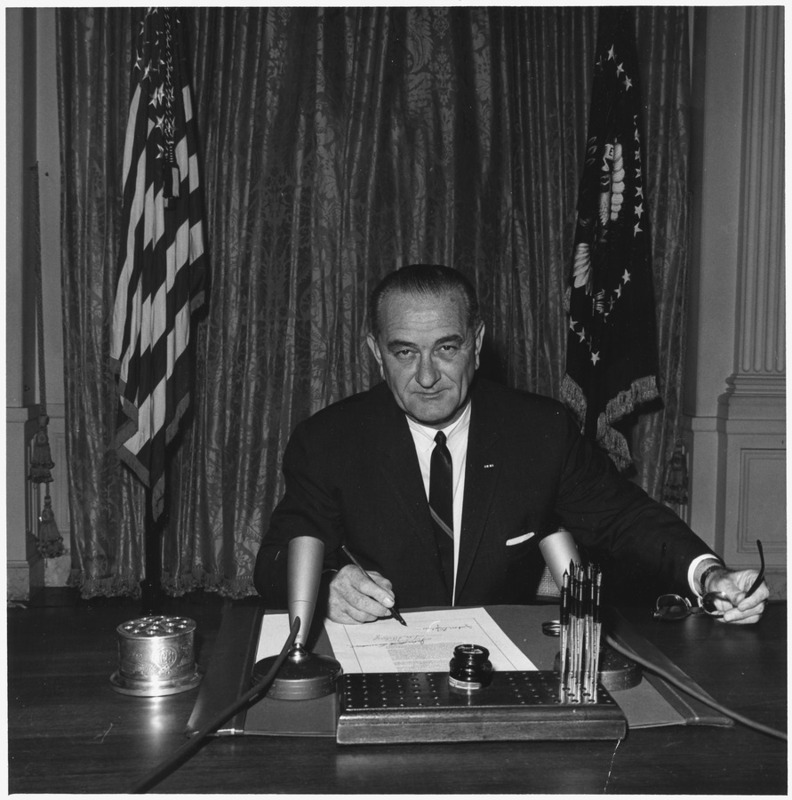 With near unanimity, legislators urged President Lyndon Johnson “to take all necessary measures to repel any armed attack against the forces of the United States and to prevent further aggression” across the length and breadth of Southeast Asia. Through the magic of presidential interpretation, a mandate to prevent aggression provided legal cover for an astonishingly brutal and aggressive war in Vietnam, as well as Cambodia and Laos. Under the guise of repelling attacks on U.S. forces, Johnson and his successor, Richard Nixon, thrust millions of American troops into a war they could not win, even if more than 58,000 died trying. To leap almost four decades ahead, think of the Authorization to Use Military Force (AUMF) that was passed by Congress in the immediate aftermath of 9/11 as the grandchild of the Tonkin Gulf Resolution. This document required (directed, called upon, requested, invited, urged) President George W. Bush “to use all necessary and appropriate force against those nations, organizations, or persons he determines planned, authorized, committed, or aided the terrorist attacks that occurred on September 11, 2001, or harbored such organizations or persons, in order to prevent any future acts of international terrorism against the United States by such nations, organizations, or persons.” In plain language: here’s a blank check; feel free to fill it in any way you like. As a practical matter, one specific individual — Osama bin Laden — had hatched the 9/11 plot. A single organization — al-Qaeda — had conspired to pull it off. And just one nation — backward, Taliban-controlled Afghanistan — had provided assistance, offering sanctuary to bin Laden and his henchmen. Yet nearly 15 years later, the AUMF remains operative and has become the basis for military actions against innumerable individuals, organizations, and nations with no involvement whatsoever in the murderous events of September 11, 2001. *In Yemen, a U.S. airstrike killed at least 50 individuals, said to be members of an Islamist organization that did not exist on 9/11. *In Somalia, another U.S. airstrike killed a reported 150 militants, reputedly members of al-Shabab, a very nasty outfit, even if one with no real agenda beyond Somalia itself. *In Syria, pursuant to the campaign of assassination that is the latest spin-off of the Iraq War, U.S. special operations forces bumped off the reputed “finance minister” of the Islamic State, another terror group that didn’t even exist in September 2001. *In Libya, according to press reports, the Pentagon is again gearing up for “decisive military action” — that is, a new round of air strikes and special operations attacks to quell the disorder resulting from the U.S.-orchestrated air campaign that in 2011 destabilized that country. An airstrike conducted in late February gave a hint of what is to come: it killed approximately 50 Islamic State militants (and possibly two Serbian diplomatic captives). Yemen, Somalia, Syria, and Libya share at least this in common: none of them, nor any of the groups targeted, had a hand in the 9/11 attacks. Imagine if, within a matter of weeks, China were to launch raids into Vietnam, Thailand, and Taiwan, with punitive action against the Philippines in the offing. Or if Russia, having given a swift kick to Ukraine, Georgia, and Azerbaijan, leaked its plans to teach Poland a lesson for mismanaging its internal affairs. Were Chinese President Xi Jinping or Russian President Vladimir Putin to order such actions, the halls of Congress would ring with fierce denunciations. Members of both houses would jostle for places in front of the TV cameras to condemn the perpetrators for recklessly violating international law and undermining the prospects for world peace. Having no jurisdiction over the actions of other sovereign states, senators and representatives would break down the doors to seize the opportunity to get in their two cents worth. No one would be able to stop them. Who does Xi think he is! How dare Putin! Yet when an American president undertakes analogous actions over which the legislative branch does have jurisdiction, members of Congress either yawn or avert their eyes. In this regard, Republicans are especially egregious offenders. On matters where President Obama is clearly acting in accordance with the Constitution — for example, in nominating someone to fill a vacancy on the Supreme Court — they spare no effort to thwart him, concocting bizarre arguments nowhere found in the Constitution to justify their obstructionism. Yet when this same president cites the 2001 AUMF as the basis for initiating hostilities hither and yon, something that is on the face of it not legal but ludicrous, they passively assent. Indeed, when Obama in 2015 went so far as to ask Congress to pass a new AUMF addressing the specific threat posed by the Islamic State — that is, essentially rubberstamping the war he had already launched on his own in Syria and Iraq — the Republican leadership took no action. Looking forward to the day when Obama departs office, Senator Mitch McConnell with his trademark hypocrisy worried aloudthat a new AUMF might constrain his successor. The next president will “have to clean up this mess, created by all of this passivity over the last eight years,” the majority leader remarked. In that regard, “an authorization to use military force that ties the president’s hands behind his back is not something I would want to do.” The proper role of Congress was to get out of the way and give this commander-in-chief carte blanche so that the next one would enjoy comparably unlimited prerogatives. Collaborating with a president they roundly despise — implicitly concurring in Obama’s questionable claim that “existing statutes [already] provide me with the authority I need” to make war on ISIS — the GOP-controlled Congress thereby transformed the post-9/11 AUMF into what has now become, in effect, a writ of permanent and limitless armed conflict. In Iraq and Syria, for instance, what began as a limited but open-ended campaign of air strikes authorized by President Obama in August 2014 has expanded to include an ever-larger contingent of U.S. trainers and advisers for the Iraqi military, special operations forces conducting raids in both Iraq and Syria, the first new all-U.S. forward fire base in Iraq, and at least 5,000U.S. military personnel now on the ground, a number that continues to grow incrementally. Remember Barack Obama campaigning back in 2008 and solemnly pledging to end the Iraq War? What he neglected to mention at the time was that he was retaining the prerogative to plunge the country into another Iraq War on his own ticket. So has he now done, with members of Congress passively assenting and the country essentially a prisoner of war. By now, through its inaction, the legislative branch has, in fact, surrendered the final remnant of authority it retained on matters relating to whether, when, against whom, and for what purpose the United States should go to war. Nothing now remains but to pay the bills, which Congress routinely does, citing a solemn obligation to “support the troops.” In this way does the performance of lesser duties provide an excuse for shirking far greater ones. In military circles, there is a term to describe this type of behavior. It’s called cowardice. Andrew J. Bacevich, a professor of history and international relations at Boston University, is the author of America’s War for the Greater Middle East: A Military History, which has just been published by Random House. He is also editor of the book,The Short American Century (Harvard Univ. Press), and author of several others, including: Breach of Trust: How Americans Failed Their Soldiers and Their Country (American Empire Project); Washington Rules: America’s Path to Permanent War,The New American Militarism: How Americans Are Seduced by War, The Limits of Power: The End of American Exceptionalism (American Empire Project), and The Long War: A New History of U.S. National Security Policy Since World War II. This entry was posted in Current News and tagged AUMF, Congress, Foreign Affairs, war by TD Daniell. Bookmark the permalink.